The Yellow-shouldered Amazon (Amazona barbadensis Gmelin, 1788), in German Gelbshulteramazone, in French Amazone à epaulettes jaunes, in Spanish Amazona hombrogualda, is a bird of the Neo-tropical eco-zoogeographic area, belonging to the order of the Psittaciforms (Psittaciformes), family of the Psittacids (Psittacidae) and genus Amazon (Amazona). 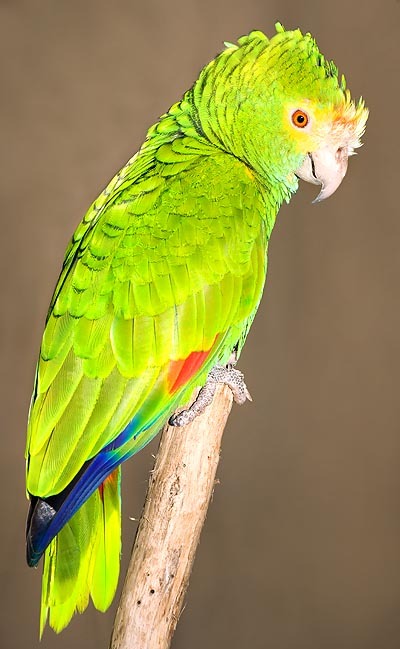 This species, even if subdivided by the International Commission of Zoological Nomenclature (ICZN) into two subspecies, the Amazona barbadensis barbadensis and the Amazona barbadensis rothschildi, do have a still much discussed taxonomy, especially in reference to the subspecies Amazona barbadensis rothschildi. Since years, and still nowadays, many ornithologists do not contemplate such subspecies or give them little significance. 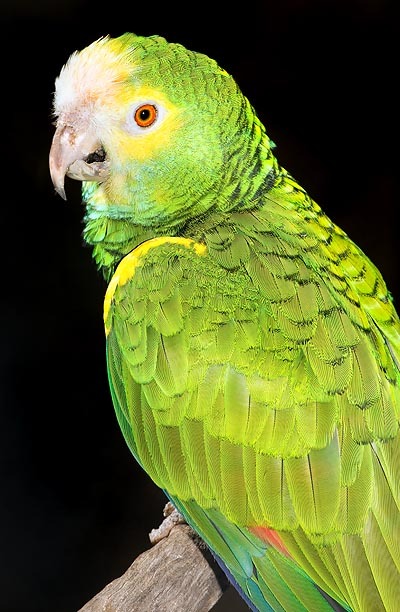 The nominal species Amazona barbadensis is contemplated in the appendix I of the Washington convention of 1975 (convention CITES), which forbids its trade; the IUCN, on the contrary, identifies its status as “endangered” species (at risk of extinction) and with a population in steady decline, due to the heavy deforestation which destroys its distribution areas, and the poaching connected with the trade of the ornamental birds. The species, as already briefly said, has already disappeared in several regions due to the deforestation, the increase of lands for agriculture, mining exploitation and the tourism. For instance in the former Dutch Antilles, nowadays Aruba Island, off the northern coasts of Venezuela, where these birds were present till about 20 years ago, and now are almost disappeared. In Margarita Island, Nueva Esparta Archipelago, off the north-western coasts of Venezuela, do still live about 1.000 protected specimens, whilst only 200 of them are found in Blanquilla and about 600 in Bonaire Island, an island of the Antilles Archipelago, Caribbean Sea, still under Dutch status, localized off the north-western Venezuelan coast. Other few protected specimens are localized along the northern coasts of Venezuela, like in the Anzoátegui, one of the states composing the Venezuela. There are several biotopes in these last regions, where these parrots have adapted. They vary from the dry areas to the savannahs, up to 450 m of altitude above the sea level. Other colonized areas are those formed by sandy soils, with thorny bushes (similar to the phrygana, or garrigue, of the Old World). In Margarita Island, they have colonized the mangroves, present there, and the thick pluvial forests. Both the nominal species and the two subspecies do have the green as dominant colour. The feathers are bordered by a slight black colouring, the front, almost up to the beak, has a white dot. Immediately over this dot, there is a yellow one which surrounds the eye and gets down to the cheeks. Also the thighs and the band colouring transversally the wings, are yellow. The lower part of the cheeks and the chin are blue, the thorax as well as the abdomen have some blue reflexes. The wings are bordered by a greyish-yellow colour, the primary coverts and the remiges, have a main violet-blue colouration; the red speculum colours the four external remiges. The tail has a grey tonality, with yellow-greenish tips; the base of the most external rectrices has a red-orange colour. The periophthalmic ring of skin is whitish, the iris is red-ora,ge and the zygodactylous feet are greyish-brown. Both male and female measure 33 cm, and do not have any sexual dimorphism, neither seasonal, nor permanent. They weigh about 300-350 g, and in the wild, they may reach the 40 years of age. They eat fruits as well as seeds (frugivorous and granivorous species), and pillage mangoes in the fruit plantations. They live in pairs as well as in groups of about 30 individuals. These species and subspecies of parrots are very careful, of shy character; therefore they are difficult to be observed, especially in the islands. On the contrary, in the continent, it is easier to see them, even if mostly while flying. For resting, they use as perches branches of trees of Acacia, which give them the shade necessary for take shelter from the sun, during the warmest hours of the day. In Margarita Island, it is not rare to see trees with the branches overcrowded by various species of Amazona among which the Amazona barbadensis. The flight is straight, but not fast, and is characterized by strong wing beats. The call is hoarse and metallic; there are seasonal migration phenomena related to the availability of food. The mating season, in the wild and also in captivity, falls between April and July, possibly influenced by the climate conditions. The nests are built by the male inside the hollows of the trees, in the giant cacti or in the cracks of the rocks. In Margarita Island, the nests are built inside the dense growths of the mangroves. The female lays from 2 to 5 eggs, measuring 3,67 x 2,61 cm and are incubated for 22-27 days. Before flying away, the newly born pullets are nourished by both parents for 53-61 days.